So, Social Media does work. 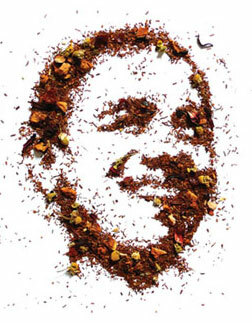 While on Twitter last week when I posted the now infamous “If Obama or McCain were a tea, what would they be” question, we were approached by Jack Cheng, a tea enthusiast, to help us with the packaging of the Presidential Blends. As you can see, they are seriously fabulous! 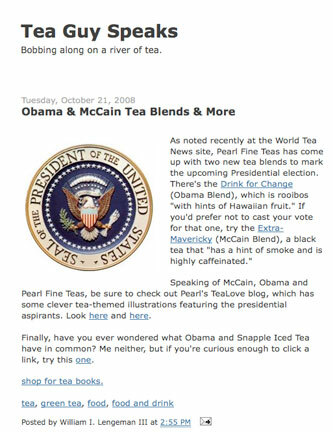 OK, you crazy TeaPeeps… Since we posted our little poll from Twitter last week on the TeaLove Blog, people have been wondering when the Obama Blend and the McCain Blend will be available. We issued a Press Release on October 14th letting people know that for a Limited Time beginning Oct 16 thru Nov 4, you can pre-order an Obama Blend or McCain Tea Blend. The teas will ship during the week of the Inauguration in January 2009. On November 5th, we’ll post the votes for which tea sold more. Anyone care to make a prediction? My friends, this robust Black Tea is bold, assertive, has a hint of smoke and is highly caffeinated. A great kick start to the day or a power boost in the afternoon. It’s fundamental difference is that it stands up to cream, sugar (and the Senate). You’ll either like it or you won’t. Sip while reading the NY Times, Wall Street Journal or following the Stock Market. Let me be absolutely clear, this African “Red Bush” Rooibos based tea is a mix of herbs with hints of fruit. It’s smooth, fresh and lacks bitterness. Environmentally friendly, unexpected, and a little left of center. Contributes to your overall well being and Health(care). Sip after reading the NY Times, Wall Street Journal or following the Stock Market. *10% of the profits from each blend will be donated to the Washington Humane Society.